My name is Judas – yes, an unfortunate name among us Followers of the Way, but common enough in my family. I belong to the church in Damascus, previously worshiping in the local synagogue, but lately in each other’s houses. The split was caused by the disintegrating relationship between hard line Pharisees and more liberal Jews, complicated by an increasing number of gentiles joining us. But that happened some time after the Saul incident that I am about to describe. Saul, a Pharisee, had been persecuting the Followers of the Way for some time – beating, imprisoning, confiscating property, even killing us. He was fiery and fiercely protective of the Jewish law, which he was convinced we were transgressing. 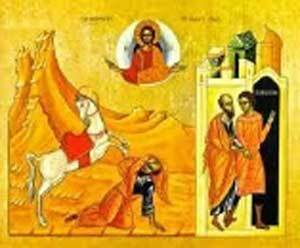 We had been warned that Saul was on his way here to Damascus to continue his persecutions against our little church. Some Pharisees were happy enough for that to happen – after all, Saul was one of them, a prominent and powerful Pharisee. But others, like Simon, were horrified, and it was he who came to warn us. Not that we could do much. There was no point in running. Saul’s influence would extend wherever he went. And so we simply waited, praying for deliverance and preparing for the worst. But what happened was totally unexpected. Some men came to my house at a some time after midday. They had Saul with them – not the Saul I would have imagined, all fire and brimstone, but a blind, gibbering mess. How they came to my house is a bit of a mystery, except that one of their company was an acquaintance, and since I live in the street called ‘Straight’, quite close to the city gates, I suppose it was to be expected that they would bring him to my house. They babbled on about a bright light that blinded them all and Saul behaving strangely, as though he had seen a ghost. Then, having deposited him on my doorstep, they fled, frightened and embarrassed. What could I do but bring him inside? I had no idea how to cope with him, and quite frankly I was scared. Saul was, after all, a dangerous man to us Followers of the Way. But my ever practical young wife took it all in her stride, and set about making him comfortable. It seemed that she was right, because after three days he became more rational, as though something had settled in him. He said that God had told him that a man called Ananias would come to restore his sight. The Ananias he spoke of did turn up at the house soon afterwards. He was one of our church members, and said that God has told him to come here and lay hands on Saul for healing. At first, knowing Saul’s reputation, he was reluctant, and told God so in no uncertain terms. But eventually he trusted the command, and, once he was with us, prayed for Saul, and the white film that had covered his eyes slipped away. Then Saul did something I would never have expected – he wept, and thanked us profusely. You can’t imagine how relieved I felt, and how grateful I was to God for such a wonderful miracle, not just for the restoration of Saul’s sight, but for his complete change of attitude. We sent out messages to others of our group, and we all gathered to witness Ananias baptise Saul. And then we shared a meal, including Saul. It seemed that his fasting was over, and food was the only appropriate response. Saul stayed among our group for some time. He regained his strength, but this time not to rampage around the countryside in search of people to imprison and kill, but to argue forcibly for Jesus, using all his knowledge of Jewish scripture and law to demonstrate his rightful place as Messiah, both of the Jews and the gentiles. As a highly respected Pharisee himself, he commanded their respect, albeit grudging at times. In fact, that was one of his gifts – the ability to meet his opponents on their own ground. It was, however, a double edged sword. While we found ourselves relatively safe and affirmed, as I said before, the rift between Synagogue and Followers grew, to the point where we were no longer welcome. We took to meeting on the first day of the week, not the Sabbath, in each other’s houses to break bread together and worship. Saul by this time had left us to travel, first to the elders in Jerusalem, and then on to other churches, and changed his name to Paul, but visited from time to time if he was passing through. If he lamented this break from his dearly held Jewish tradition, he never showed it, entering gladly into our prayer and worship, sometimes even presiding at the Eucharist, and always preaching. Meanwhile, like Paul, we had also taken on a new identity, one that was coined in Antioch by opponents, and meant to be an insult. We became ‘Christians’, and since Jesus had showed us just how effective insults could be turned into assets, we wore the badge proudly. Paul’s visits were sporadic, but in the interim we were able to follow his movements through his letters, and not just to us. Over the years he wrote prolifically to all the churches, and if one of their members visited, they would share his letters with us. The scribes among us copied them carefully, and we treasured them, reading and re-reading them. They not only kept us in touch with our friend, but contained great insights and wisdom that would occupy our minds and fuel our discussions for weeks. One such visit took place not so long ago. Paul stayed with us for a month, and I found myself once again welcoming him into my little house in Straight Street, but this time things were not so confusing – for him or for me. In fact we were reminiscing one evening about the circumstances of our first meeting. After much good natured laughter we lapsed into thoughtful silence. After a while he said, “You know what really got to me that day? Oh it wasn’t just the bright light or the vision, or even the blindness. It was the way Jesus said, ‘Why do you persecute me?’ I thought I was just punishing those pesky Followers of the Way, but now I see that this is exactly the role of the Messiah, to wear his people’s suffering. Jesus doesn’t just point the way, he is the Way. It’s taken me a long time to think this out, but before that, I never realised how much God identified with his people – Jew or Gentile. When I went back over the scriptures I began to see for the first time the love that permeated his dealings with us Jews, especially in promising the Messiah. I think I’d spent my whole life zealous for God, but never really understanding that love. Jesus has made that possible, and I want people to know that he is the Messiah, the one for whom my people have waited for centuries. I used to think that the Messiah would come to rescue us, the Jews, and drive out all those opposed to the his Kingdom. But I didn’t count on this incredible love that caused him to be put to death for his people, or his power being expressed in rising from the dead – not to punish, but to forgive his enemies and bring them into his kingdom. My raging around the country and treating his Followers as enemies was totally contrary to what the Messiah is all about. While I was busy trying to kill and eradicate those whom I saw as worthy only of death, I should have been reconciling them to me, and I to them, in friendship, which was, and still is, his whole life’s message. I am so thankful to have had first hand experience of that life-changing forgiveness, that reconciled me to him in love. Paul left us a few days later, and I somehow felt that it would be the last time we would see him. He had said something about the Spirit sending him to Rome, and I wondered what would become of him. As I said, all this Good News is a double edged sword, and he had already suffered for his new found allegiance to Jesus. In fact it wasn’t long after his conversion that he had to be smuggled out of the Damascus because of violent opposition, so any news of his execution would come as no surprise to us. Our grief will be deep, but not inconsolable. Jesus sees to that. After all who else could bring life out of death, or sight out of blindness?